It features a rectangle shape. This vessel is designed to be installed as an above counter vessel. It is constructed with ceramic. It is designed for a single hole faucet. The top features a 6-in. profile thickness. This vessel comes with a enamel glaze finish in White color. Above counter white ceramic vessel with a unique drain location. Can be installed as a standalone wall-hung vessel or as a above counter vessel on a cabinet. Large integrated bowl features an overflow underneath the chrome drain cover. This Vessel features Chrome hardware. Double fired and glazed for durability and stain resistance. Quality control approved in Canada and re-inspected prior to shipping your order. Faucet and accessories not included. This traditional vessel belongs to the exquisite Emily design series. It features a rectangle shape. This vessel is designed to be installed as an above counter vessel. It is constructed with ceramic. It is designed for a deck/wall mount faucet. This vessel comes with a enamel glaze finish in White color. It features a rectangle shape. This vessel is designed to be installed as an wall mount vessel. It is constructed with ceramic. It is designed for a 4-in. o.c. faucet. The top features a 0.75-in. profile thickness. This vessel comes with a enamel glaze finish in White color. This modern vessel belongs to the exquisite Xena Farmhouse design series. It features a rectangle shape. This vessel is designed to be installed as an semi-recessed vessel. It is constructed with ceramic. It is designed for a 4-in. o.c. faucet. This vessel comes with a enamel glaze finish in White color. 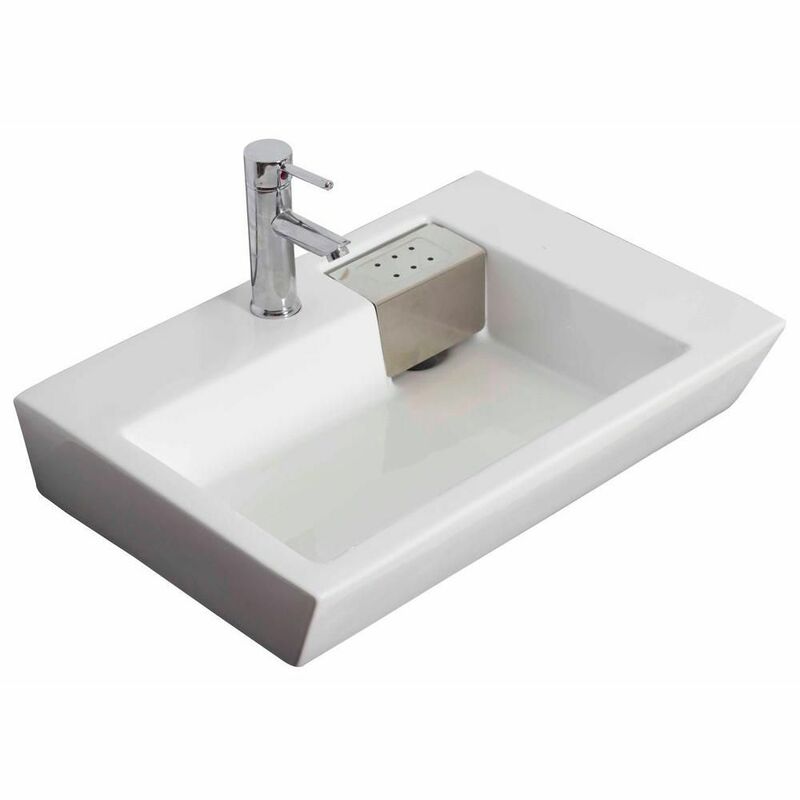 26-inch W x 18-inch D Rectangular Vessel Sink in White with Chrome It features a rectangle shape. This vessel is designed to be installed as an above counter vessel. It is constructed with ceramic. It is designed for a single hole faucet. The top features a 6-in. profile thickness. This vessel comes with a enamel glaze finish in White color.